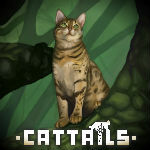 Nicer Mountain Cats | Cattails: Become a Cat! For the past few weeks I've been trying to befriend all the mountain cats as a Mystic cat. However I noticed that even when I got 5 stars with everyone, they all still treated me like a total stranger. I think we should make the mountain cats a bit nicer towards you when start to become friends with them. By what one of the people who have their cat as an character inside mystic colony they did the diolouge for it so the people who made the diolouge for their cats in the mountain colony might of made it that way it's just a guess seeing the mountain colony might have incomplete diolouges?